If you wish to be notified of further training dates as soon as they are announced, please email us. 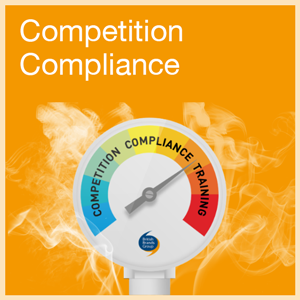 This full-day course for suppliers outlines how competition law impacts you and your business, why it is so important, how to avoid compliance problems, the implications of the Bribery Act, consumer pricing principles and what to do if subjected to a Dawn Raid. Timings: 0930 for 1000 start, 1600 close. At the end of the course you will receive all the key documents to take away. All managerial and other staff who communicate in any way with competing suppliers and/or with distributors. This course is run in partnership with Bristows LLP, a law firm specialising in competition law. The training is delivered by a business professional practising in training, coaching and mentoring and a qualified competition lawyer from Bristows.